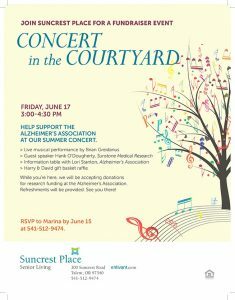 Help support the Alzheimer’s Association at our Concert. Live musical performance by Brian Greidanus. Guest speaker Hank O’Dougherty, Sunstone Medical research. Information table with Lori Stanton, Alzheimer’s Association. Harry and David gift basket raffle. ← Long Term Care: Is Your Family Covered?